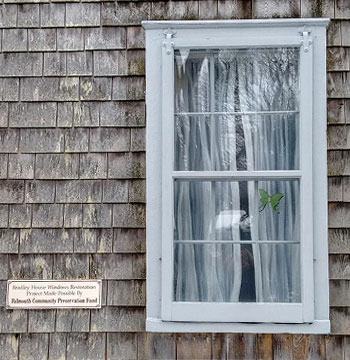 The Woods Hole Historical Museum requested and was granted $30,000 from the CPFund for a $35-38,000 project to restore historical windows in the museum, a house known as the Bradley House, constructed around 1804. The home lies within the Woods Hole Historic District and is listed in the state’s Cultural Resources Inventory. Captain William H. Bradley bought the home at auction in 1821 for $339.99. Joseph Story Fay bought it from the widowed Mrs. Betsey Bradley in 1871 with the provision that she could live there for the balance of her natural life. The Fay family moved it to its current location and in 1948 donated it to the Woods Hole Public Library. It is the third oldest building in Woods Hole Village and was designated as the Woods Hole Historical Museum in 1976 as an archival outgrowth of the Woods Hole Public Library. It houses a collection of objects and materials of cultural, historical, and artistic value illustrating the history of the Village, its inhabitants, and institutions. It holds photographs, over 500 audio recordings of oral history, 200 volumes of maritime and local history. Two other buildings also house historic exhibits: the Yale Workshop holds the tools and documents of a 19th century gentleman, and the Sail Boat Museum displays small local craft. The New England Document Conservation Center conducted a full survey of the archive and made recommendations about its preservation and accessibility. Museum personnel worked for a semester with students at the Rhode Island School of Design to generate ideas about how best to address the needs of the Museum and its public. The Massachusetts Board of Library Commissioners also provided guidance for renovating Bradley House to the standards of a secure archival facility.